NewZNew (Chandigarh) : Chandigarh is all set for “J90 Presents Big Chandigarh Marathon”, a mega sports event organised jointly by J90, a project of Mona Townships Pvt Ltd and 92.7 BIG FM which is scheduled to be held on March 15th, 2015. 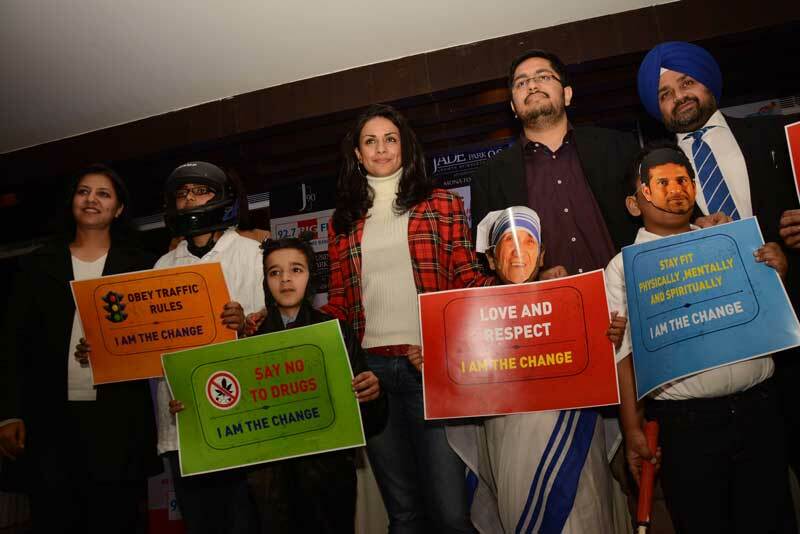 The message being given through this marathon is “I am the Change” for proud residents of Chandigarh. Both J90 and Big FM feel that “Together – WE can make the change; Together we can BE that change, so YOU can stand up and say, I AM THE CHANGE”. A Press Conference to launch the “J90 Big Chandigarh Marathon” was held today at Chandigarh by the organizing officials of Mona Townships Pvt Ltd and 92.7 BIG FM. It was disclosed that more than 5,000 Chandigarhians have already registered for the the “J90 Big Chandigarh Marathon” and anyone interested can register by just giving a missed call on 180030 101 927 and be a part of it. The marathon this year will be divided into two parts, one for General Public 5km Run and other is Half Marathon 21 km for professional runners. While the 5 km Dream Run would start at 7:30 am, the 21 km run would start at 6 am, both from Rock Garden. The flag-off ceremony for Marathon will be done by Mr Sagar Setia, Director, Mona Townships Pvt Ltd in the presence of local and Bollywood celebrities. The 5-km run will be a run for a cause & every kilometre in this run will be dedicated to a cause like respect & love for senior citizens, respect for women, drug abuse, observing traffic rules and focus on health and fitness, which are paramount and affect the society at large. 18-50 (Male ) : 1st winner will get: 50,000; 2nd will get 30,000; 3rd winner will get 20,000. 18-50 (Female) 1st winner will get: 50,000; 2nd will get 30,000; 3rd winner will get 20,000. An adventurer, marathoner and social activist, Gul Panag , former beauty queen & actress, has been declared as the face of the J90 Big Chandigarh Marathon 2015. Gul Panag who was also present at the Press Conference hails from the City Beautiful and runs an NGO which works towards a variety of causes, including gender equality, education and disaster management. Speaking on the occasion BIG FM spokesperson said that we as responsible corporate citizens are always at the forefront of taking such initiatives which bring about productive & noble social changes in the growth of the city. Mr Sagar Setia, Director, Mona Townships Pvt Ltd, said, “This association is very close to my heart. Through this event we have tried to spread the message that there is a need to look at growth from a new perspective which goes with the tagline of J90, which is ‘Growth Reinvented’. Many Star celebrities from bollywood as well as pollywood are expected to join Chandigarhians in this cause on 15th March . The organizers said elaborate traffic and security arrangements have been made to make the marathon successful and smooth. Next articleThe Art of Beering – in Mohali! Tanaaz Irani replaces Delnaaz Irani in Zee TV’s Jamai Raja!